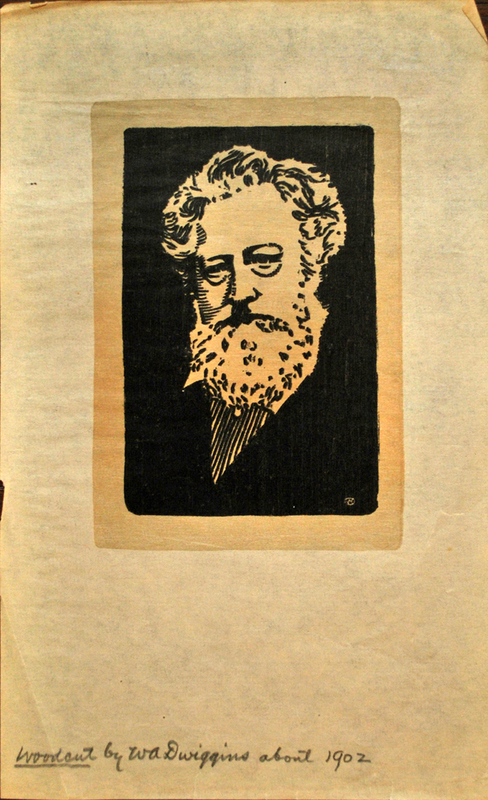 Woodcut portrait of William Morris by W.A. Dwiggins from “The Poetry of William Morris” by Wallace Rice in The Blue Sky: A Monthly Magazine, vol. V, no. 1 (April, 1902). Image courtesy of Special Collections, University of Arizona. W.A. Dwiggins (1880–1956) lived in Chicago from the fall of 1899 to the summer of 1903. During that brief time he was initially a student at the Frank Holme School of Illustration and then a studio mate of his mentor Frederic W. Goudy (1865–1947). Together he and Goudy executed several designs for The Blue Sky Press, the private press founded by Alfred Langworthy (1876–1956), Thomas Wood Stevens (1880–1942), and Alden Noble (1880–1942) at Hyde Park on the south side of the city near the University of Chicago. 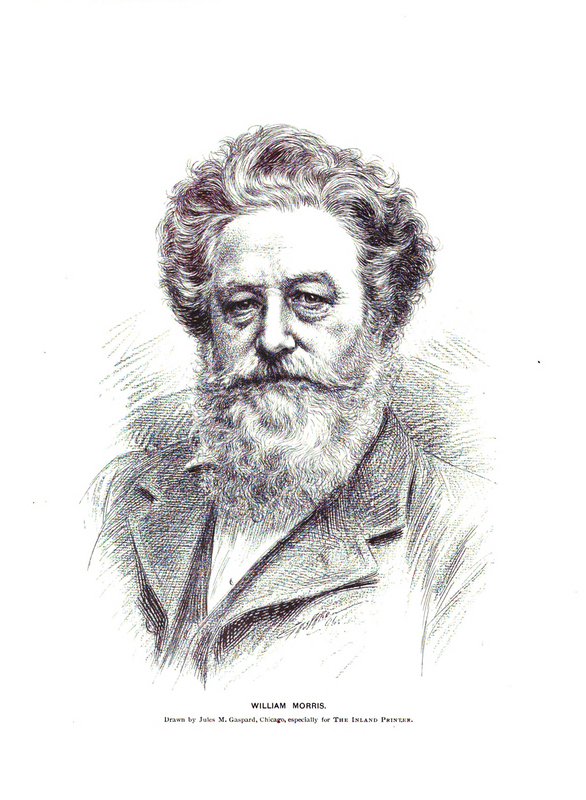 Among them was a portrait of William Morris (1834–1896) that accompanied “The Poetry of William Morris” by Wallace Rice in the April 1902 issue of The Blue Sky, the trio’s magazine. 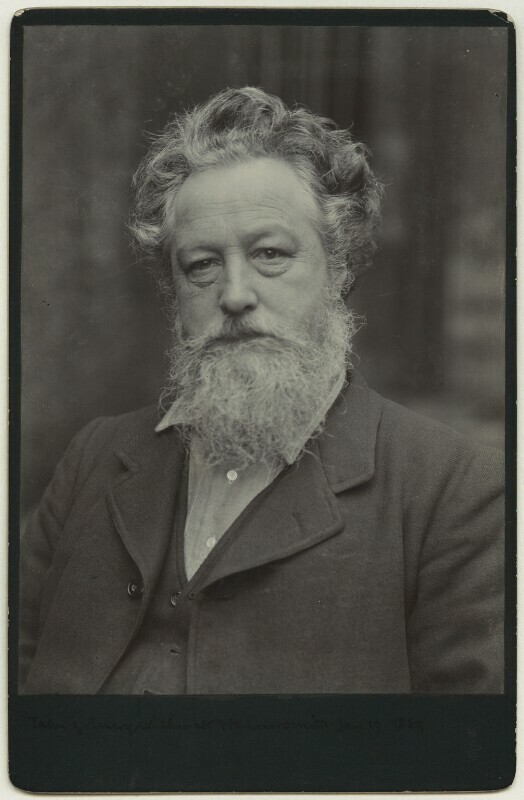 It was signed with a W within a D.
Cabinet card portrait of William Morris by Emery Walker (19 January 1889). Photographs Collection NPG x3733, National Portrait Gallery, London. Dwiggins was not the first person to convert Walker’s photograph into an illustration. Alamy, the stock imagery agency, offers a wood engraved illustration derived from it that comes from the Lebrecht Music and Arts Photo Library. Identified only as “illustration after photograph by Walker and Bontall [sic],” it is unclear when it was made and where it appeared. The striping of Morris’ shirt suggests that Dwiggins may have worked from this wood engraving rather than Walker’s original photograph. Wood engraving of William Morris after photograph by Walker and Boutall (n.d.). Artist unidentified. From Lebrchts Music and Arts Photo Library via Alamy. 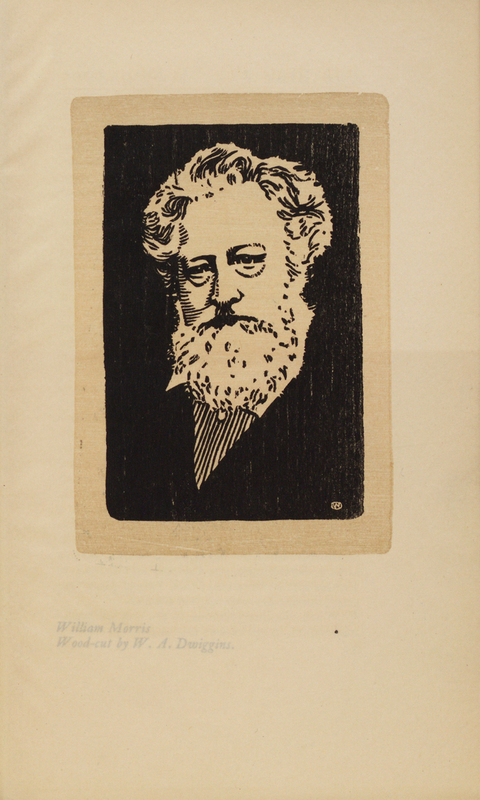 Portrait of William Morris by Jules M. Gaspard for The Inland Printer vol. XVIII, no. 3 (December 1896), p. 64. The Morris portrait is one of several woodcuts that Dwiggins did during his Chicago days, the others being bookplates, a decorative initial, and a letterhead for The Ridge Shop. With the exception of the latter, I believe they were all school projects. The portrait was probably done at the same time Dwiggins’ pen-and-ink portrait of Eugene Field was made since it too follows closely one drawn by Gaspard. 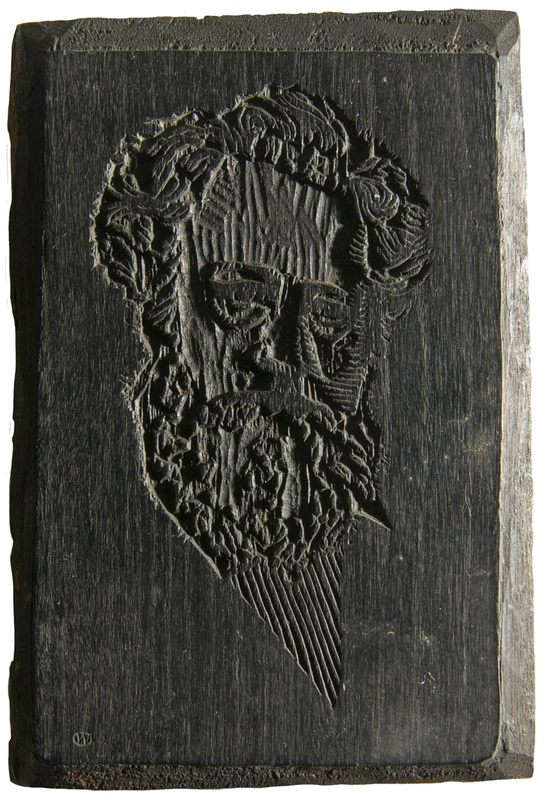 Woodblock for William Morris portrait by W.A. Dwiggins (before 1902). Courtesy of The Newberry Library. Test proof on Japanese paper of woodcut portrait of William Morris by W.A. Dwiggins (c.1901). Courtesy of The Newberry Library. 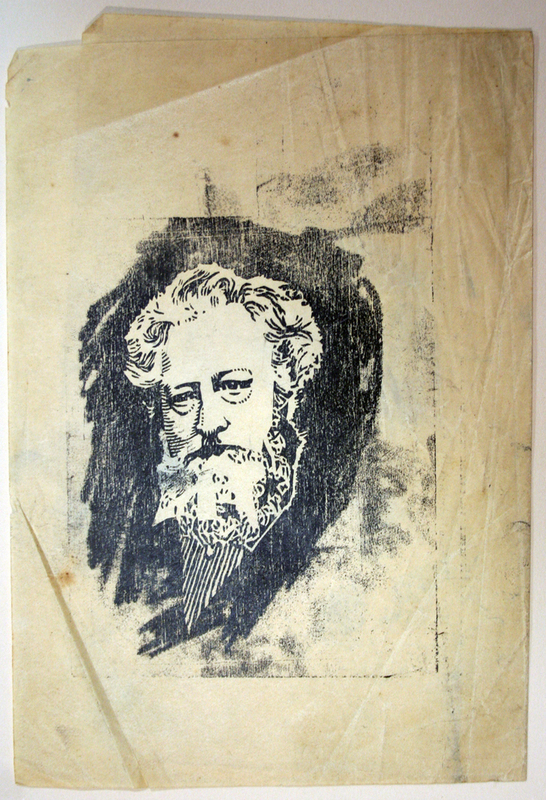 Proof on Japanese paper of woodcut portrait of William Morris by W.A. Dwiggins (c.1901). Photograph by Eric Frazier. Courtesy of the Library of Congress. Presumably Dwiggins created the Morris portrait by first tracing over either the Walker photograph or the wood engraving based on it. In “copying” the image he simultaneously altered it, simplifying the hair and beard, stylizing the shadows on the cheek and brow, and ignoring the suit. The new drawing was then transferred (in reverse) to the block of wood for cutting, where additional changes to the original image were made. Dwiggins’ portrait of William Morris may not be one of his most original illustrations, but it provides useful insight into his art education as well as his early influences. 1. For the history of The Blue Sky Press see “The Blue Sky Press of Hyde Park, 1899–1907” by Paul Kruty in Chicago History: The Magazine of the Chicago Historical Society vol. XI, no. 3 (Fall & Winter, 1982), pp. 141–155. The work that Dwiggins and Goudy did for The Blue Sky Press included a broadside and magazine cover for The Blue Sky magazine, and In a Balcony by Robert Browning (Chicago: The Blue Sky Press, 1902). These items will be discussed in a future post. 2. “Portrait, wood-cut, W.A. Dwiggins,” p. 31 as part of “The Poetry of William Morris in Relation to His Artistic Life” by Wallace Rice in The Blue Sky: A Monthly Magazine vol. V, no. 1 (April 1902), pp. 23–35. 3. For William Morris’ impact on printing in the United States see American Book Design and William Morris by Susan Otis Thompson (New York: R.R. Bowker Co., 1977). 4. See The Dial vol. XXV, no. 298 (November 16, 1898), pp. 343–346. The rare book department at McClurg’s, run by George Millard, carried Kelmscott Press books and items about William Morris. 5. “William Morris and the Kelmscott Press” by T.L. Mills in The Inland Printer vol. XVIII, no. 3 (December 1896), pp. 298–301. Gaspard’s drawing precedes Mills’ article. 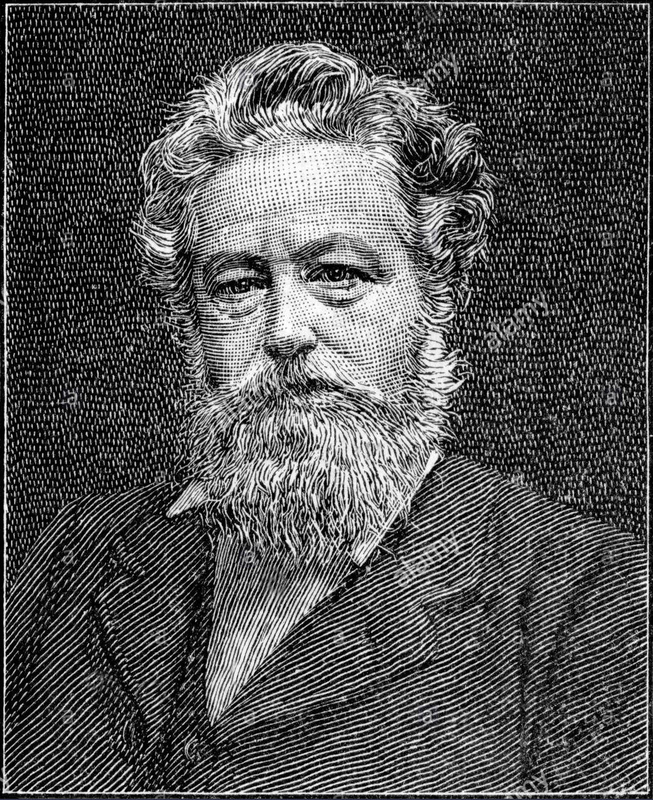 William Morris died October 3, 1896. 6. See the advertisement for the Frank Holme School of Illustration in Brush and Pencil vol. 5, no. 3 (December 1899), p. 24 which includes a head shot of J.M. Gaspard. Gaspard joined the faculty in mid-October 1899, a month or so before Dwiggins enrolled in the school. After the School of Illustration folded, Gaspard moved East where he was in charge of Roycroft Publications for Elbert Hubbard from 1908 to 191o. See obituary in the New-York Tribune 19 February 1919, p. 8. 7. Four woodcuts by Holme are listed in the John Francis Holme Collection 1886–1938 at the University of Arizona. See Series VI, Box 21. Also see the woodcuts in Her Navajo Lover by W.H. Robinson (Phoenix: The Bandar Log Press, 1903). 8. The Morris portrait woodblock is in Case Wing ZY 983 .D991, The John M. Wing Collection, The Newberry Library along with woodblocks for bookplates for Della Purdum Fordyce and Mabel Hoyle and a decorative initial S. None of the blocks are dated, but a proof of two bookplates is annotated by Dwiggins: “Engraver’s Prints will be done shortly. Will make them up in holiday package. Hope you are well little ma.” This suggests they were designed in late 1901. 9. The test proof is in Case Wing ZY 983 .D991, The John M. Wing Collection, The Newberry Library. The final proof is in Box 14, Frederic W. Goudy Papers, Rare Books and Special Collections, Library of Congress.